Computed tomography (CT) is the established method for the imaging evaluation of traumatic injury to the abdomen and pelvis. This role has been galvanized in the era of multidetector CT (MDCT) because of the greater speed and flexibility afforded by this modality. MDCT can now image the head, entire spine and torso, often in less time than would be typical for obtaining a standard three-view radiographic trauma series (portable chest, lateral C-spine and AP pelvis). When coupled with its accuracy for detecting multisystem injuries, CT has become the indispensable means by which prompt diagnosis and triage is undertaken for the stable trauma patient. Additionally, the high quality image data sets now obtained from MDCT permit the routine use of post processing techniques such as multiplanar reformation (MPR), maximum intensity projection (MIP) and three-dimensional (3D) image display for improving evaluation and communication of diagnostic results. Since most traumatic injury is not isolated to a single anatomic region, abdominal and pelvic imaging is usually undertaken in the context of a complete system evaluation of the multitrauma patient that often includes imaging of the head, entire spine and torso. As previously published by several authors, following a head CT without intravenous contrast material (IVCM), scanning is performed from the circle of Willis, or alternatively, from the thoracic inlet to the symphysis pubis following the intravenous administration of nonionic IVCM (100-150 ml of 300 mg iodine/mL, Ultravist 300) using an injection rate of at least 3 cc/s. Imaging through the abdomen should be timed so that it commences during the portal venous phase of homogeneous parenchymal enhancement. Early or delayed scanning may falsely simulate injury or decrease conspicuity of true injury. At our institution, the emergency radiologist immediately reviews a trauma patient's scans while the patient is on the CT table. When injury is present, delayed imaging is generally performed approximately 3 minutes after the initial IVCM injection, or during the pyelographic phase. Delayed imaging is not performed if no significant injury is detected, thereby reducing radiation exposure for these patients. If immediate review of the initial scan is not an option based on radiologist's availability, or if the incidence of injury is high among a given institution's trauma population, routine acquisition of a delayed scan in every patient may prove a more efficient means of operating procedure. An unen-hanced CT is performed in patients with known renal insufficiency or severe contrast allergy, though sensitivity for detecting injury is reduced. Oral contrast material (OCM) is not routinely used at our trauma center at the time of the initial CT evaluation. Though the use of OCM has been shown to be safe, the perception of providers at our institution is that it delays transit to CT, results in the otherwise unnecessary placement of a nasogastric tube in many patients, and owing to the speed of MDCT, is increasingly of little benefit having rarely progressed beyond the stomach to typical areas of injury by the time CT is performed in most patients. Instead, once immediate life-threatening injuries have been excluded by an initial CT scan, patients with suspected bowel injury based on clinical grounds or results of the initial scan are reimaged after administration of water soluble OCM and a relatively short time for bowel transit, usually about 1 hour. Rectal contrast material should be administered in all patients with penetrating injuries to the abdomen or flank. Approximately 50 cc of Ultravist 300 (or any IVCM of similar iodine concentration) is injected into a liter of warm saline for use as contrast material. Adequate colonic distention generally involves administration of approximately 500 cc rectal contrast material with the patient in a left lateral decubitus position for suspected left colonic injury, or up to a liter of contrast material with the patient in a right lateral decubitus position for suspected right colonic injury. Use of intravenous, oral and rectal contrast material (i.e., triple contrast CT) has been shown to be a highly accurate means of excluding peritoneal violation in the setting of penetrating trauma to the flank. Additionally, among those patients with peritoneal violation, CT has been reported to accurately predict the need for laparotomy with 100% sensitivity, 96% specificity, 100% negative predictive value, and 97% accuracy. When bladder injury is suspected, CT cystography is performed. Antegrade filling of the bladder from renal excretion of IVCM is insufficient for excluding bladder injury. Bladder contrast is easily obtained by mixing 50 cc Ultravist 300 in a liter of warm saline. Following the initial scan of the abdomen and pelvis with IVCM, the Foley catheter is unclamped, permitting complete drainage of excreted contrast material. A closed system is used to connect the liter of saline to the indwelling Foley catheter and contrast is instilled in a retrograde fashion with the saline bag approximately 40 cm above the height of the patient's bladder (i.e., the height of the CT table). 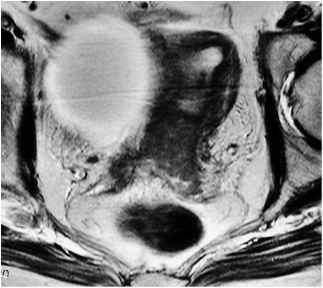 Bladder contrast is instilled until one of the following: 1) contrast flow stops, 2) 350 to 400 cc of contrast have been instilled, or 3) the patient no longer tolerates contrast instillation. Adequate retrograde distention of the bladder is critical for its proper evaluation. Furthermore, CT cystography should not be performed until after the initial CT scan through the abdomen and pelvis with IVCM. This allows easy discrimination between arterial extravasation and bladder contrast extravasation, both of which are encountered in the setting of pelvic fractures. The spleen is the most commonly injured solid organ in the setting of blunt abdominal trauma, representing approximately 25% of all blunt injuries to the abdominal viscera. The spleen is a highly vascular organ that weighs approximately 75-100 grams in the average adult, contains approximately one unit of blood at any given time and circulates approximately 350 liters of blood per day. With greater recognition of its important immunologic roll, there has been a progressive trend toward the conservative, nonoperative management of splenic injury among hemodynamically stable patients. Today, more than half of all patients with splenic injury are managed nonoperatively. parenchymal hematomas are seen as intrasplenic low attenuation collections. Active hemorrhage, pseudoa-neurysms and arteriovenous fistulas appear as areas of increased density relative to the normally enhancing splenic parenchyma and are of similar attenuation value to an adjacent major artery, generally within 10 Hounsfield units (HU) (i.e., contrast blush [CB]). Traumatic injury may also result in segmental or complete splenic devascularization. Relying on CT appearance alone to accurately predict those patients requiring splenectomy versus those who can be managed nonoperatively would be highly advantageous. Unfortunately, despite a number of CT grading systems, none has proven reliable in predicting outcome for nonoperative management. Using logisitic regression, Schurr et al. showed that CT splenic injury grade had no predictive value for nonoperatively-managed patients. Other studies have shown that CT often underestimates the severity of splenic injury. There is also significant interobserver variability among radiologists in their grading of splenic injury. Despite these limitations, CT has nonetheless greatly facilitated the trend toward nonoperative management, if for no other reason than its contribution toward excluding other injuries that would require surgical exploratory laparotomy. More recent radiology literature suggests that some CT findings may have strong predictive values for failed nonoperative management. These include: 1) active hemorrhage, 2) post-traumatic pseudoaneurysm, and 3) arteriovenous fistula. All three of these lesions may be seen as a 'contrast blush' on the initial phase of CT scanning. The latter two splenic vascular injuries cannot be further differentiated on contrast-enhanced CT. However, the latter two can be differentiated from active hemorrhage on delayed scanning, at which time the arterial attenuation 'blush' typically decreases to become isodense or minimally hyperdense compared to the normally enhancing splenic parenchyma. Conversely, the arterial 'blush' persists during delayed scanning with active hemorrhage since the contrast material has ex-travasated from vascular structures and therefore does not 'wash-out'. Furthermore, whereas the splenic vascular injuries of post-traumatic pseudoaneurysm and arte-riovenous fistula are always intrasplenic, active hemorrhage may be intrasplenic, subcapsular or freely intraperitoneal (Fig. 1) (Tab. 1). Among those managed nonoperatively, the majority of failures will occur within 24 hours of admission. Gavant and colleagues reported an 82% failure rate among patients with contrast extravasation or intrasplenic vascular injury (pseudoaneurysm or arteriovenous fistula) who were managed nonoperatively. Other investigators have shown that patients with a CB by CT are 9.2 times more likely to require surgical laparotomy or angiographic em-bolization. In effect, a CB at CT has a high correlation with failure of nonoperative management. However, to date this finding has not been included in any of the widely used splenic injury grading criteria. Hepatic injury represents approximately 15-20% of all blunt injuries to the abdominal viscera, placing it as the second most commonly injured solid organ in the setting of blunt abdominal trauma. However, hepatic injury is the most common cause of death following abdominal injury. Historically, most liver injuries were treated surgically despite the fact that as many as 70% had stopped bleeding by that time. Further, a comparison has shown that operative management requires more blood transfusions and results in more complications than does nonoperative management. For these reasons, and given the greater ability to diagnose and monitor hepatic injuries by CT, there has been a progressive trend toward the conservative, nonoperative management of these injuries among hemodynam-ically stable patients. Today, approximately 80% of all patients with hepatic injury are managed nonoperatively. 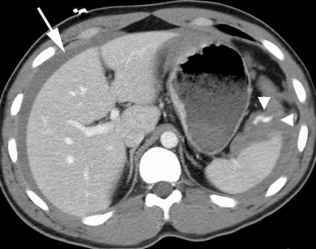 Hepatic injury may be manifest on CT as parenchy-mal contusion, intraparenchymal or subcapsular hematomas, intrahepatic lacerations, vascular injuries including pseudoaneurysms and arteriovenous fistulas, and active arterial hemorrhage. Parenchymal contusions are seen as poorly defined areas of decreased parenchymal enhancement. Subcapsular hematomas are generally seen as well defined elliptical or crescentic collections of blood that reside immediately below the hepatic capsule, often compress the subjacent hepatic parenchyma and are of lower attenuation than the enhancing hepatic parenchyma. Presence of parenchymal compression helps differentiate subcapsular hematoma from perihep-atic hematoma. Intrahepatic lacerations are seen as linear or complex and branching areas of low attenuation coursing through the normally enhancing hepatic parenchyma, whereas intraparenchymal hematomas are seen as intrahepatic low attenuation collections (Fig. 2).